Like a line of porcelain dolls they sat, one, two and three, on the couch in that living room three thousand six hundred metres and nine floors above sea level. There was no mistaking them in their multi-layered skirts, with their long plaits either side, in their cherished bowler hats. They were ladies of Aymaran stock, indigenous citizens of Bolivia. Knit two, purl one, so the patterns went, knit three, purl one, as the knitting needles clicked, as the ladies transformed the library of yarn on the shelves about the living room into jumpers, knit two, and cosy woollen hats with ear flaps, purl three, or vests for spoilt pet dogs in the cold-climate west. The fleece was especially soft and warm, as it was not sheep's wool but from alpacas, that smaller relative of the llama to be found in Bolivia's villages, knit one. They knitted items for export; they knitted for an essential salary in Bolivianos. We had few words, knit three, purl one, for my inadequacy in Spanish was oftentimes equalled by theirs and of Aymaran I knew not a word. But I could smile and say, with flexible grammar, simple things like 'would you like a cup of coca tea?' Their chatting would stop, knit two, they'd giggle to each other, purl one, and agree. In the kitchen I arranged the metallic camping mugs, one, two, three and four and got to work on making the local brew, easy enough with just a coca tea bag and boiling water. The apartment in the Bolivian capital of La Paz belonged to a knitting cooperative, and they were village ladies, oftentimes victims of domestic violence and / or single mothers. I taught English but in that space I'd rented a room. As the steaming yellowish cups of coca tea met the coffee table they'd smile and giggle. Coca tea can prevent altitude sickness and remove hunger, but we liked its taste, knit five and purl two. 'They're not used to being served tea by a man,' my landlady, also my student, explained of their laughter. These were the little things that once were, in that place so far removed from the Bangladeshi delta. It was near time to leave Bolivia when I bought the box of coloured pencils. Little gifts for Hatiyans, it was always hard. Sometimes Australians would say, 'Just take a bunch of second-hand clothes.' I don't suppose you can expect them to understand the difference between charity and friends. I'd always had a budget but wouldn't be giving anything I wouldn't be happy giving anyone else; and it should be something a bit special. Example: in Bolivia they play zampoñas or pan flutes, traditional instruments for mountain music, of many bamboo pipes of varying length arranged vertically; unlike the horizontal standard flute. The player has to move the instrument across their mouth to blow in the tube that makes the note they wish to play. 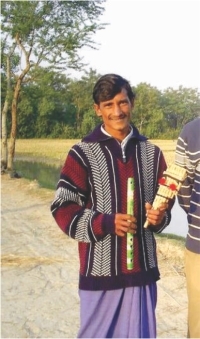 Nashir used to make his own flutes, he taught himself, and some evenings we'd walk Hatiyan villages and he'd play flute songs to our Chad Mama, or Moon Uncle. In Bolivia, Nashir's gift was an easy choice. The women were always harder. For men lungi would do it. The Indonesian lungi is of thicker cloth and is longer; hotter but more robust than the Bangladeshi variety. I'd bought a stack of those once in Kuala Lumpur on my way towards Dhaka. The shopkeeper had been surprised. So I sat with coloured pencils and paper, picturing the brightness of saris, mapping patterns of Hatiyan inspiration. With slight embarrassment I showed my amateur sketches to my landlady, the head of the cooperative. 'Can the ladies knit those?' I tried to tell her of the delta island villages; where the shawls they'd make would go. But honestly, who can explain Mrs Das? I was back in Sydney when the packages arrived. My landlady said the ladies had really enjoyed trying new patterns and colours, knit six, purl two. About a month later I flew to Dhaka. Amma, my Bengali mother, said the size was a little small: that was my doing in part, but also how they're worn in La Paz. Hatiyans know about gifts much better than westerners do. I'd always marvelled about how if you gave anything to Situ's kids, within minutes they'd be shared: there was a bunch of cheap bangles for his daughter once. Soon all the neighbours' daughters had one or two on their arms. And I won't forget the perfume. I'd bought the one my Australian mother and sister liked, a bit expensive but cheap-smelling I couldn't give. Mrs Das, my Didi, you know what she did? Bless her. She opened the bottle and sprayed everyone in range with some. She shared. As I watched those fine droplets propel into the air towards her son, her husband and the neighbours: a kind of alchemy I knew it to be. She was turning materialism, no less, and possession, into community and love. It was so simple. And the shawls, and the Bolivian tablecloths I'd bought at the witches' market in La Paz, which in Hatiya became shawls, they were shared. Mrs. Das's son would as often wear hers; in another house, knit two, purl one, it kept toes warm in the winter nights. How I wish the ladies could meet their Hatiyan counterparts. Communication would be hard; but I'm sure, knit three, purl one, they have much in common. A year later back in Bolivia, in that living room, just quietly, I noticed a few of my little pattern creations had found their way into some of the other items, knit one. From my pencil maybe they'd come, but in inspiration, purl two, they were patterns from Bangladesh, with love. As for Nashir, I don't know if he ever mastered the pan flute like he manages with his home-made ones, though he could certainly get a better sound out of it than I could. I'll have to ask him. But a few years later I saw it at his house in the glass showcase. He told me a Noakhailla family had wanted to buy it for a sizeable sum. I wouldn't have blamed him if he'd sold it, knit two, but he'd told them, purl one, it was a gift and not for sale.